A refereeing decision completely turned this game as debutant goalkeeper Martin Horsell was controversially sent off after 40 minutes when the assistant referee deemed that Horsell, who had signed earlier this week from Conference North Hereford FC, deliberately handled the ball outside of his box to deny TJ Davis. The incident came about after a long ball downfield caught out Jerel Ifil and after lengthy consultation produced his red card despite it looking like the ball hit Horsell in the chest and any impact with his hand was made when the keeper had his back turned. Defender Matt Williams took the gloves, although he’s more used to wearing gloves of the boxing kind in his spare time. The resulting free kick went straight into the wall with the follow up being blasted out wide for a goal kick. Frome had taken the lead just before the quarter of an hour mark when Ryan Bath slid in at the back post converting Rickie Scott’s cross to put the troubled visitors into the lead which was the first shot on target for either side. Bath almost doubled The Robins lead, but his curling effort went just wide of Horsell’s right hand post from 25 yards. The closest the hosts got to scoring was when Ifil headed wide after half an hour and Mat Liddiard saw a low header deflect wide for a corner on the stroke of half-time as the hosts failed to get to grips with the game and create any substantial chances on the visitors goal who were already content to waste time and kill the game at 1-0. The game was as good as over when eleven minutes into the second half Tom Mehew scored at the back post from a Frome counter attack converting substitute Rex Manning’s low cross. Ollie Knowles curled home a low free kick into the far corner around the wall past the unfortunate Williams in goal following a foul on Davis on the edge of the area. Williams then made a stunning save (see photo below) to spare Ifil any further blushes when he dived low down to his right to turn away the defenders deflection before Marcus Mapstone rose highest to head home with four minutes to play to secure an unlikely win for the Robins. 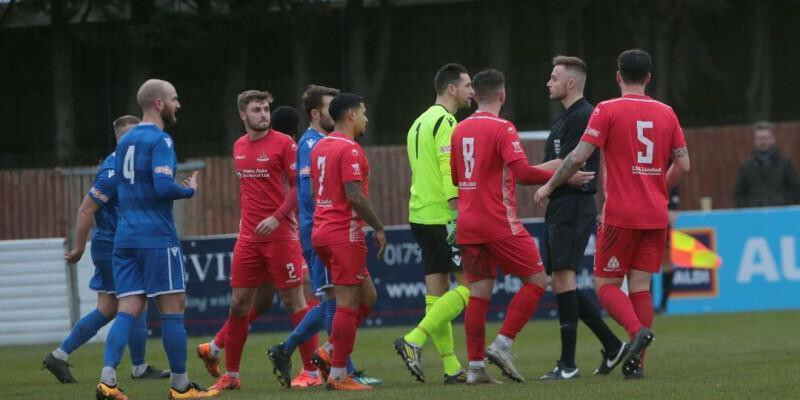 Marine were made to pay for their own slow start and barely got out of first gear before the opening goal, but credit must go to Frome who stifled Marine from playing their own brand of football, but ultimately and unfortunately the game was decided by the officials before half-time. Marine need to erase this game from their memory and regather themselves for a trip to league table topping Taunton Town next Saturday. It will be interesting to see what happens with the goalkeeper situation for this game, so keep an eye on www.swindonsupermarinefc.com, on our twitter feed @SupermarineFC and on Facebook www.facebook.com/swindon.supermarine for news as we get it.